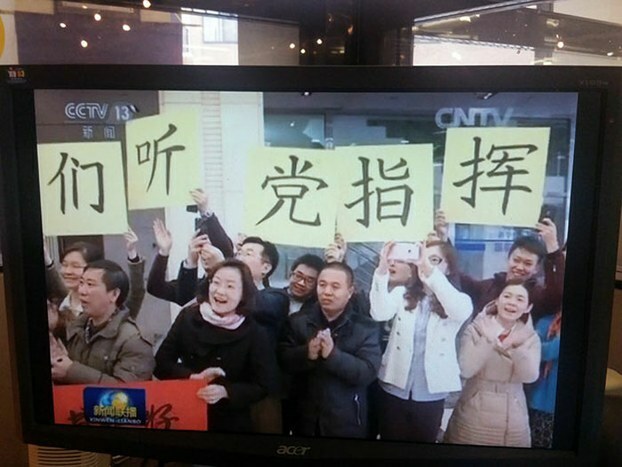 State media workers are shown celebrating President Xi Jinping’s media tour in this screen shot from CCTV broadcast, Feb. 19, 2016. President Xi Jinping’s call for unswerving loyalty from the state media to the ruling Chinese Communist Party, speaks to the president’s ambition to lead a world superpower and echos Beijing’s growing concern over its international image, analysts told RFA’s Chinese services. Last Friday, Xi’s tour of party mouthpieces: The People’s Daily, state news agency Xinhua and state broadcaster China Central Television (CCTV) made headlines as photos showed fervent media workers holding up banners pledging loyalty to the party. In one iconic image, Xi is shown sitting in the news anchor’s chair. Xi’s visit also underlined support at the highest level for the projection of state-backed Chinese journalism far beyond the country’s borders, as he “showed approval” for Xinhua’s international expansion, which offers the voice of the Chinese government in news products and services in eight languages. With party propaganda chief Liu Yunshan in attendance, Xi also made a video call to CCTV’s Washington-based North America branch, which opened more than four years ago, Xinhua reported. “Xi praised the branch for its work and sent his greetings to the staff, 90 percent of whom are Americans,” the agency said. In a speech to a media symposium the same day, Xi made no bones about the fact that the Chinese media are indivisible from the ruling party. “The fundamental issue of the party’s media work is to strictly adhere to the party’s leadership,” Xinhua quoted Xi as saying. “All news media run by the party must work to speak for the party’s will and its propositions and protect the party’s authority and unity,” he said, calling for more “Marxist” education for China’s journalists. China’s journalists should be “disseminators of the party’s policies and propositions,” providing guidance to the public and serving the country’s overall interests, he said. Journalists should be chosen for their firm political beliefs, Xi said. The rallying call to the media, which is already minutely managed by the party’s propaganda ministry under Liu, reflects Xi’s personal political ambition to preside over a global superpower, according to Ran Bogong, former politics professor at Toledo University. Xi’s propaganda offensive is also a charm offensive, aimed at improving China’s international image, he explained. Last November, Reuters reported that the Chinese government secretly controls a network of overseas radio stations in 14 countries, indicating that Beijing is already taking its propaganda to a global audience. At least 33 overseas radio stations are now majority-owned by the party’s international broadcaster China Radio International (CRI), forming a global radio network structured to hide its true ownership, Reuters said. The stations routinely broadcast Beijing’s take on global events to listeners in their own countries, using material that is created or supplied by CRI’s headquarters, or that originates from media companies that it controls, the report said. Xie Jiaye, head of the New York-based Chinese Association of Science and Technology, said Xi is rallying state media in a bid to counteract the predominance of negative news stories about China in the Western media. But he said the attempt to project homegrown propaganda overseas might not work. “They need to engage find different ways to engage in calm debate across a various kinds of international media,” he added. Xie said Xi also intends to use the party’s formidable propaganda machine to boost adherence to the official line within the party itself. This could also backfire, if overseas media are seen as having close ties to the Communist Party, he said. The lack of separation of party and state could diminish the legitimacy of Chinese media outlets overseas, he explained. Xi’s propaganda push comes after the International Federation of Journalists highlighted top-down controls over China’s media in its annual report for 2015. “Propaganda, censorship, surveillance, intimidation, detention, brutality and attacks and televised ‘confessions’ have become go-to tools for the government as they tighten their grip on the media and the press in 2015,” the New York-based group said in a statement on its website. President Xi has made the “united front” a key part of his plan to extend the Communist Party’s global influence via overseas intellectuals and rich businesspeople, especially in the media. At the heart of the soft power approach lies Beijing’s concern with “hostile foreign forces,” often portrayed as the Western media and its emphasis on press freedom, human rights, and constitutional and democratic politics. Reported by Yang Jiadai for RFA’s Mandarin Service, and by Ho Shan for the Cantonese Service. Translated and written in English by Luisetta Mudie. This entry was posted in Headlines and tagged Media, Xi Jinping. Bookmark the permalink.